Oats (Avena sativa) are a type of cereal grain. People use them as food for themselves and other animals, for example, chickens and horses. Oatmeal is made from oats. Oat straw is used as bedding for animals. Oats are rich in both soluble and insoluble fiber. Oats are also a good place to get protein. Oats are low in unsaturated fat and contain no cholesterol. Oats are also a good place to get vitamin B1. 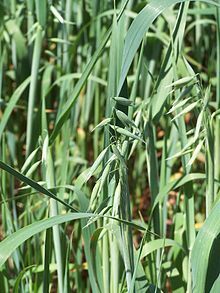 The wild ancestor of Avena sativa and the similar minor crop, A. byzantina, is the hexaploid wild oat A. sterilis. Science of DNA shows that the ancestor forms of A. sterilis grew in the Fertile Crescent of the Near East. Domesticated oats appear later. They are also far from the Near East, in Bronze Age Europe. Oats are like rye. They are normally thought as a less important crop, i.e. coming from a weed out of the main cereals wheat and barley As these cereals spread into cooler, wetter places, this may have favored the oat weed. This quickly leads to its common use. Oats are grown all over temperate places. They have a lower summer heat need and are able to survive more rain than other cereals like wheat, rye or barley. Oats are an annual plant, and can be planted either in autumn (for late summer harvest) or in the spring (for early autumn harvest). Historical attitudes towards oats are very different. Oat bread was first made in England, where the first oat bread factory was made in 1899. In Scotland, are well liked, as a good part of the national diet. The English writer Samuel Johnson, famously wrote in A Dictionary of the English Language that the oat was a grain, which in England is generally given to horses, but in Scotland supports the people. Which the Scottish quickly said back "and England has the best horses, and Scotland the best men." Oats have many uses in food. Most of the time they are rolled or crushed into oatmeal, or ground into oat flour. Oatmeal is also eaten as porridge, but may also be used in many of baked goods, such as oat cakes, oatmeal cookies, and oat bread. Oats are also an substance used in many cold cereals, in particular muesli and granola. Without cooking, oats may also be taken as food. Oats are also sometimes used in drinks. In Britain, it is used for making beer. Oatmeal stout is one of many beers using some oats. A cold, sweet drink made of ground oats and milk is a well liked drink in Latin America. 'Oatmeal caudle', made of ale and oatmeal with spices was a usual British drink and well-liked by Oliver Cromwell. In Scotland a dish called Sowans was made by putting the husks from oats in water for a week so that the fine, dusty part of the meal remained at the bottom to be strained off, boiled and taken as food (Gauldie 1981). 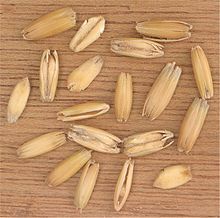 Oats are also widely used there as a thickener in soups, as barley or rice might be used in other countries. Oats are also commonly used as feed for horses - as whole or rolled oats or as part of food bits. Cattle are also fed oats, either whole, or ground into a flour using a mill. Oat straw is prized by cattle and horse makers as bedding, because its soft, almost dust-free, and takes in liquid. The straw can also be used for making corn dollies. Tied in a cotton bag, oat straw was used to soften bath-water. Things take out of oatscan also be used to make pain less sharp in the skin, as in skin lotions. It is the main substance in the Aveeno line of products. Oats are mostly thought as "healthy" food. The finding of the healthy cholesterol-lowering properties has led to more liking of oats as human food. Oat is the only cereal having a globulin or legume-like protein, avenalin, as the major (80%) storage protein. Globulins can be taken up by weak salt water. The more common cereal proteins are gluten and zein. 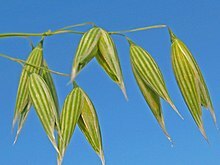 The minor protein of oat is avenin. Oat protein is almost the same in quality as soy bean protein, which has been shown by the World Health Organization to be equal to meat, milk, and egg protein. The amount of protein of the hull-less oat kernel ranges from 12–24%, which is the highest among cereals. ↑ "AVEENO Skin Care Products". Aveeno.com. Retrieved 2009-08-10. ↑ Lasztity, Radomir (1999). The Chemistry of Cereal Proteins. Akademiai Kiado (English). ISBN 978-0849327636.